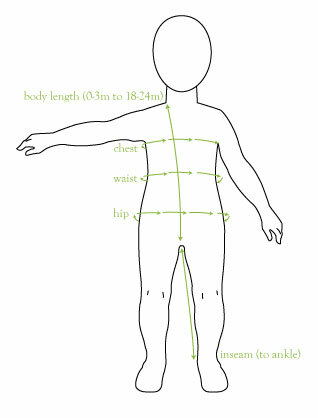 These are our general recommendations for fit but we cannot guarantee that every item will fit every baby the same. See care instructions below. Please note, if anything our sizes will run small so please size up. Please Note: Certain styles of our Bamboo Line and the WOODS are made smaller due to style and fabric. These fabrics have more give and stretch. We have made notes on the product pages for the items that run small. When in doubt, it is always best to size up. care instructions: washing instructions are printed on the reverse side of the label inside each of our garments. In general, wash in cold or warm temperature water which should not exceed 40°C/105°F with like colors. Turn the garment inside out to wash and dry. Use mild laundry soap (non-toxic, biodegradable types preferred). Do not use any type of bleach as it will fade the colors and weaken the garments’ fiber strength. Normal tumble dry at the low heat setting, and iron at medium setting (150°C/300°F) if desired. Please also note that conventional cotton is generally treated with chemicals to reduce the shrinkage effects. Our organic cotton is not treated, so it is possible for it to shrink 3-5%. Use this link for a guide to the FTC product care symbols: www.apparelsearch.com/care_label_symbols.htm. fabric softener is not advised. Please note that washed items are not eligible for return or exchange.